March 19, 2013 • Page 8 1650 Houses For Sale shop online at www.missourivalleyshopper.com 1650 Houses For Sale Cabin for Sale: Metal garage, boat ramp & dock. Priced to sell! Leave message, 402-336-3678. 1114 E. 15th St. For Sale by Owner $125,000 3-bedroom, 2-bath brick home with hardwood floors. 3-car detached garage including a shop area. Call (605)689-2100. 125 E. Chicago St. Home for sale in Tabor https://sites.google.com/site/12 5chicagostreet/ or call (605)463-2410. 1655 Mobile Homes For Sale 2-Bedroom 12x60 mobile home. New roof, new windows, new furnace. Call (605)665-5473 or (605)660-0063. HIGHEST CASH PRICES PAID FOR MOBILE HOMES Call (605)624-8001. For Sale by Owner: 1009 First St., Crofton, NE. 3+bedrooms, oak hardwood floors, utility main floor, 1,200 sq.ft. Walk-out basement with apartment for extra income. Call (605)760-3072 or (605)665-8924. Call Classi?eds 665-5884 Save thousands on new mobile home. Set up in mobile courts in Beresford, Vermillion, and Yankton. We finance with proper down payment. Call for details. Nationwide Mobile Homes (605)665-0822. Visit our Web site at www.missourivalleyshopper.com 1655 Mobile Homes For Sale Wow!!! Want a brand new Mobile Home set up in Vermillion on a contract for deed? With a proper down payment, we can help make that happen for you. Quit making the landlord rich, and start owning your home. Call us now. Nationwide Mobile Homes. (605)665-0822. 1660 Acreage - Lots For Sale For Sale: Lots of lots! Call Jim Tramp, (605)661-2192. Ridgeway North Development has numerous lots available. North of Hillcrest Golf Course. Call Kirby Hofer, (605)665-0524 or (605)660-1422. Large Inventory at Great Prices! New Equipment Coming In Daily! COMBINES 18 MONTH 0% INTEREST WAIVER (C) 2012 CIH 7130, 138 hrs, 42” duals, PRO 700, corn & bean . . . .$258,000 (A) 2012 CIH 8230, 251 hrs., R42 duals, auto guide, 40’ unloader . .$275,000 (A) 2012 CIH 7230, 98 hrs., 520/85R42 duals, Auto Guide . . . . $285,000 (A) 2011 CIH 7088, 253 hrs., 18.4R42 duals, trkr, Pro 600 . . . . $224,000 (A) 2011 CIH 7120, 239 hrs,. R42 duals, Auto Guide, HD drive . $245,000 (A) 2011 CIH 6088, 202 sep hrs., duals, Pro 600 . . . . . . . . . . . $225,000 (A) 2011 CIH 7120, 219 sep hrs., duals, Auto Guide ready . . . . $245,000 (A) 2011 CIH 7120 407 sep. hrs., duals new, good cond . . . . . . $230,000 (A) 2011 CIH 8120, 457 sep hrs., duals, Auto Guide ready . . . . $232,000 (N) 2010 CIH 6088, 560 hrs., 42” duals, corn & bean . . . . . . . . $205,000 (O) 2010 CIH 6088, 350 hrs., 18.4R42 duals. . . . . . . . . . . . . . . $205,000 (A) 2009 CIH 5088, 741 hrs, 42” duals, corn & bean . . . . . . . . $180,000 (N) 2009 CIH 7120, 587 sep hrs . . . . . . . . . . . . . . . . . . . . . . . . $215,000 (A) 2006 CIH 8010, 1,122 hrs . . . . . . . . . . . . . . . . . . . . . . . . . . $150,000 (C) 2003 CIH 2388, 1431 hrs., R38 duals, trkr, univ. disp . . . . . $110,000 (C) 2002 CIH 2388, 1760 sep hrs . . . . . . . . . . . . . . . . . . . . . . . . $95,000 (N) 2001 CIH 2388, 2016 sep/2710 eng. hrs., 18.4x38 duals . 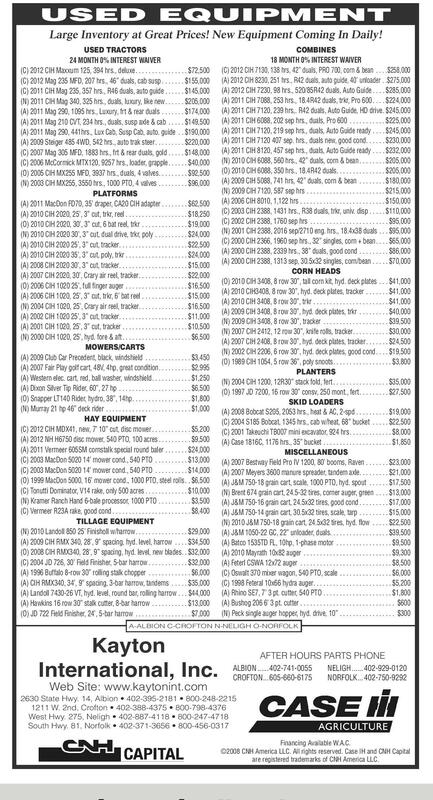 . . $95,000 (C) 2000 CIH 2366, 1960 sep hrs., 32” singles, corn + bean . . . . $65,000 (A) 2000 CIH 2388, 2339 hrs., 38” duals, good cond . . . . . . . . . $86,000 (A) 2000 CIH 2388, 1313 sep, 30.5x32 singles, corn/bean . . . . . $70,000 CORN HEADS (O) 2010 CIH 3408, 8 row 30”, tall corn kit, hyd. deck plates . . . $41,000 (A) 2010 CIH3408, 8 row 30”, hyd. deck plates, tracker . . . . . . . $41,000 (A) 2010 CIH 3408, 8 row 30”, trkr . . . . . . . . . . . . . . . . . . . . . . . $41,000 (A) 2009 CIH 3408, 8 row 30”, hyd. deck plates, trkr . . . . . . . . . $40,000 (N) 2009 CIH 3408, 8 row 30”, tracker . . . . . . . . . . . . . . . . . . . . $39,500 (N) 2007 CIH 2412, 12 row 30”, knife rolls, tracker . . . . . . . . . . . $30,000 (A) 2007 CIH 2408, 8 row 30”, hyd. deck plates, tracker . . . . . . . $24,500 (N) 2002 CIH 2206, 6 row 30”, hyd. deck plates, good cond . . . . $19,500 (O) 1989 CIH 1054, 5 row 36”, poly snoots . . . . . . . . . . . . . . . . . . $3,800 PLANTERS (N) 2004 CIH 1200, 12R30” stack fold, fert . . . . . . . . . . . . . . . . . $35,000 (O) 1997 JD 7200, 16 row 30” consv, 250 mont., fert . . . . . . . . . $27,500 SKID LOADERS (A) 2008 Bobcat S205, 2053 hrs., heat & AC, 2-spd . . . . . . . . . . $19,000 (C) 2004 S185 Bobcat, 1345 hrs., cab w/heat, 68” bucket . . . . . $22,500 (C) 2001 Takeuchi TB007 mini excavator, 924 hrs . . . . . . . . . . . . . $8,000 (A) Case 1816C, 1176 hrs., 35” bucket . . . . . . . . . . . . . . . . . . . . . $1,850 MISCELLANEOUS (A) 2007 Bestway Field Pro IV 1200, 80’ booms, Raven . . . . . . . $23,000 (A) 2007 Meyers 3600 manure spreader, tandem axle. . . . . . . . . $21,000 (A) J&M 750-18 grain cart, scale, 1000 PTO, hyd. spout . . . . . . $17,500 (N) Brent 674 grain cart, 24.5-32 tires, corner auger, green . . . . $13,000 (A) J&M 750-16 grain cart, 24.5x32 tires, good cond . . . . . . . . . $17,000 (A) J&M 750-14 grain cart, 30.5x32 tires, scale, tarp . . . . . . . . . $15,000 (N) 2010 J&M 750-18 grain cart, 24.5x32 tires, hyd. ?ow . . . . . $22,500 (A) J&M 1050-22 GC, 22” unloader, duals. . . . . . . . . . . . . . . . . . $39,500 (A) Batco 1535TD FL, 10hp, 1-phase motor . . . . . . . . . . . . . . . . . $9,500 (A) 2010 Mayrath 10x82 auger . . . . . . . . . . . . . . . . . . . . . . . . . . . $9,300 (A) Feterl CSWA 12x72 auger . . . . . . . . . . . . . . . . . . . . . . . . . . . . $8,500 (C) Oswalt 370 mixer wagon, 540 PTO, scale . . . . . . . . . . . . . . . . $6,000 (C) 1998 Feteral 10x66 hydra auger. . . . . . . . . . . . . . . . . . . . . . . . $5,200 (A) Rhino SE7, 7’ 3 pt. cutter, 540 PTO . . . . . . . . . . . . . . . . . . . . . $1,800 (A) Bushog 206 6’ 3 pt. cutter . . . . . . . . . . . . . . . . . . . . . . . . . . . . . $600 (N) Peck single auger hopper, hyd. drive, 10” . . . . . . . . . . . . . . . . . $300 Acreage - Lots For Sale 42507 Songbird Near Tabor Access Private 11.48 acre economical property. 2006 3-bedroom, 2-bath home, full walkout basement. $219,000 Lisa, Anderson Realty, LLC (605)661-0054. Multi-Family 100x170 lot on Sawgrass in Fox Run. $37,500. Lisa, Anderson Realty, LLC. (605)661-0054. 1685 USED EQUIPMENT USED TRACTORS 24 MONTH 0% INTEREST WAIVER (C) 2012 CIH Maxxum 125, 394 hrs., deluxe . . . . . . . . . . . . . . . . $72,500 (C) 2012 Mag 235 MFD, 207 hrs., 46” duals, cab susp . . . . . . . $155,000 (C) 2011 CIH Mag 235, 357 hrs., R46 duals, auto guide . . . . . . $145,000 (N) 2011 CIH Mag 340, 325 hrs., duals, luxury, like new . . . . . . $205,000 (A) 2011 Mag 290, 1095 hrs., Luxury, frt & rear duals . . . . . . . $174,000 (A) 2011 Mag 210 CVT, 234 hrs., duals, susp axle & cab . . . . . $149,500 (A) 2011 Mag 290, 441hrs., Lux Cab, Susp Cab, auto. guide . . $190,000 (A) 2009 Steiger 485 4WD, 542 hrs., auto trak steer . . . . . . . . . $220,000 (C) 2007 Mag 305 MFD, 1883 hrs., frt & rear duals, gold . . . . . $148,000 (C) 2006 McCormick MTX120, 9257 hrs., loader, grapple . . . . . . $40,000 (O) 2005 CIH MX255 MFD, 3937 hrs., duals, 4 valves. . . . . . . . . $92,500 (N) 2003 CIH MX255, 3550 hrs., 1000 PTO, 4 valves . . . . . . . . . $96,000 PLATFORMS (A) 2011 MacDon FD70, 35’ draper, CA20 CIH adapter . . . . . . . . $62,500 (A) 2010 CIH 2020, 25’, 3” cut, trkr, reel . . . . . . . . . . . . . . . . . . . $18,250 (O) 2010 CIH 2020, 30’, 3” cut, 6 bat reel, trkr . . . . . . . . . . . . . . $19,000 (N) 2010 CIH 2020 30’, 3” cut, dual drive, trkr, poly . . . . . . . . . . $24,000 (A) 2010 CIH 2020 25’, 3” cut, tracker. . . . . . . . . . . . . . . . . . . . . $22,500 (A) 2010 CIH 2020 35’, 3” cut, poly, trkr . . . . . . . . . . . . . . . . . . . $24,000 (A) 2008 CIH 2020 30’, 3” cut, tracker. . . . . . . . . . . . . . . . . . . . . $15,000 (A) 2007 CIH 2020, 30’, Crary air reel, tracker . . . . . . . . . . . . . . . $22,000 (O) 2006 CIH 1020 25’, full ?nger auger . . . . . . . . . . . . . . . . . . . $16,500 (A) 2006 CIH 1020, 25’, 3” cut, trkr, 6’ bat reel . . . . . . . . . . . . . . $15,000 (N) 2004 CIH 1020, 25’, Crary air reel, tracker. . . . . . . . . . . . . . . $16,500 (A) 2002 CIH 1020 25’, 3” cut, tracker. . . . . . . . . . . . . . . . . . . . . $11,000 (A) 2001 CIH 1020, 25’, 3” cut, tracker . . . . . . . . . . . . . . . . . . . . $10,500 (N) 2000 CIH 1020, 25’, hyd. fore & aft . . . . . . . . . . . . . . . . . . . . . $6,500 MOWERS/CARTS (A) 2009 Club Car Precedent, black, windshield . . . . . . . . . . . . . . $3,450 (A) 2007 Fair Play golf cart, 48V, 4hp, great condition . . . . . . . . . . $2,995 (A) Western elec. cart, red, ball washer, windshield . . . . . . . . . . . . $1,250 (A) Dixon Silver Tip Rider, 60”, 27 hp . . . . . . . . . . . . . . . . . . . . . . $6,500 (O) Snapper LT140 Rider, hydro, 38”, 14hp . . . . . . . . . . . . . . . . . . $1,800 (N) Murray 21 hp 46” deck rider . . . . . . . . . . . . . . . . . . . . . . . . . . $1,000 HAY EQUIPMENT (C) 2012 CIH MDX41, new, 7’ 10” cut, disc mower . . . . . . . . . . . . $5,200 (A) 2012 NH H6750 disc mower, 540 PTO, 100 acres . . . . . . . . . . $9,500 (A) 2011 Vermeer 605SM cornstalk special round baler . . . . . . . $24,000 (C) 2003 MacDon 5020 14’ mower cond., 540 PTO . . . . . . . . . . $13,000 (C) 2003 MacDon 5020 14’ mower cond., 540 PTO . . . . . . . . . . $14,000 (O) 1999 MacDon 5000, 16’ mower cond., 1000 PTO, steel rolls . . $6,500 (C) Tonutti Dominator, V14 rake, only 500 acres . . . . . . . . . . . . . $10,000 (N) Kramer Ranch Hand 6-bale processor, 1000 PTO . . . . . . . . . . $3,500 (C) Vermeer R23A rake, good cond . . . . . . . . . . . . . . . . . . . . . . . . $8,400 TILLAGE EQUIPMENT (N) 2010 Landoll 850 25’ Finisholl w/harrow . . . . . . . . . . . . . . . . $29,000 (A) 2009 CIH RMX 340, 28’, 9” spacing, hyd. level, harrow . . . . $34,500 (O) 2008 CIH RMX340, 28’, 9” spacing, hyd. level, new blades. . $32,000 (C) 2004 JD 726, 30’ Field Finisher, 5-bar harrow . . . . . . . . . . . . $32,000 (A) 1996 Buffalo 8-row 30” rolling stalk chopper . . . . . . . . . . . . . $6,000 (A) CIH RMX340, 34’, 9” spacing, 3-bar harrow, tandems . . . . . $35,000 (A) Landoll 7430-26 VT, hyd. level, round bar, rolling harrow . . . $44,000 (A) Hawkins 16 row 30” stalk cutter, 8-bar harrow . . . . . . . . . . . $13,000 (O) JD 722 Field Finisher, 24’, 5-bar harrow . . . . . . . . . . . . . . . . . $7,000 1660 Commercial Real Estate Business for sale: Cabinet ship with gift store, raised panel door equipment, 4,500 square feet brick building, 402-843-5560. Read & Recycle! Commercial Real Estate 3-Lots left Approx. 1-acre lots (176?x227?) Oil Road- BY Water- Beautiful view of Jim River Valley. 2-miles east of Casey’s on 8th & Burleigh, then 1/2 mile north. Country View Acres (605)661-0120 (605)665-3193 (605)661-1249 Business Opportunity: Turn-key restaurant in prime location available for lease. Must have restaurant management experience and adequate capital. Please contact (605)760-7214 for further details. Want To Buy Real 1700 Estate ADT We pay cash for used mobile homes! (712) 252-4381. 1690 1690 Merchandise Monitoring Package, FREE Home Security System $850 value! $99 Install Fee! PLUS New Customer Bonus! Call now! 877-450-0903 ADT Auth Co. nani EdenPURE® Portable Infrared Heaters. Join the 3 million beating the cold and winter heating bills. SAVE $229 on our EdenPURE® Model 750. CALL NOW while supplies last! 1-888-686-8209 (MCN) OWOUT! BL ICING! PR Rem a in in g Sled s,G ea r, an d Accesso ries Huge Selection to Choose From! 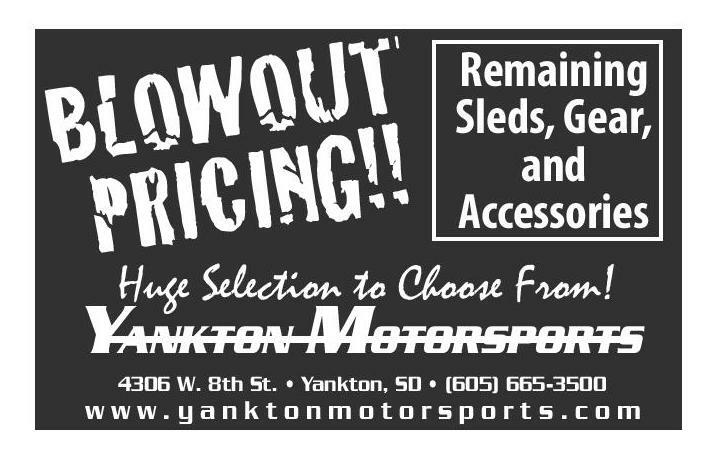 YANKTON MOTORSPORTS 4306 W. 8th St. • Yankton, SD • (605) 665-3500 www.yanktonmotorsports.com SPRING SAVINGS (3) 2011 Chevy Impala LT, Starting at...............$12,900 2010 Chevy Silverado 1500, EXT Cab.............$15,995 2009 Chevy Silverado, REG Cab, Longbox......$10,900 2008 Chevy Uplander Van, Short Style...............$8,900 2008 Chevy HHR, LT, White, Lots of Fun!..........$7,900 2007 Chevy Silverado, EXT Cab, 4x4 ..............$14,900 2007 Ford Ranger, 4 cyl auto, AC.......................$6,500 2006 GMC, CREW Cab, 4x4 Z71, 89K............$15,500 2006 Pontiac G6 4dr...........................................$7,700 1998 Pontiac Firebird Convertible, Black, 79K....$5,995 1995 Dodge 4x4 Reg. Cab.................................$2,995 Tony and Donna Ellis • 605-665-3720 • 1200 Ellis Road, Yankton, SD 57078 A-ALBION C-CROFTON N-NELIGH O-NORFOLK Kayton International, Inc. Web Site: www.kaytonint.com AFTER HOURS PARTS PHONE ALBION ...... 402-741-0055 CROFTON ... 605-660-6175 NELIGH ...... 402-929-0120 NORFOLK ... 402-750-9292 Financing Available W.A.C. ©2008 CNH America LLC. All rights reserved. Case IH and CNH Capital are registered trademarks of CNH America LLC. www.missourivalleyshopper.com Look into the Classifieds to find dogs, cats and plenty of other pets looking for a home like yours! 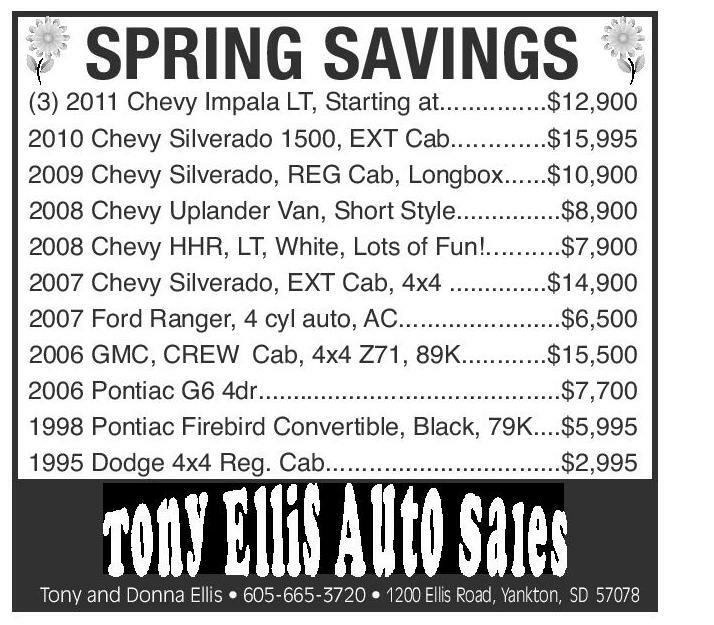 www.missourivalleyshopper.com To place a Classified ad, please call 605-665-5884.